Based in Charlotte, NC, The Light Source has been creating innovative solutions for hanging and lighting theatres, studios, churches and other places where people gather. Their line of LED lighting is made in-house and can illuminate most any space. The exciting release for NAB 2018 though is their new MEGABATTEN product that combines power and data in a pipe you hang the fixtures on. The patent-pending MEGABATTEN dispenses with the traditional connector strip square or rectangular electrical enclosures by placing all of the wirings inside the pipe. 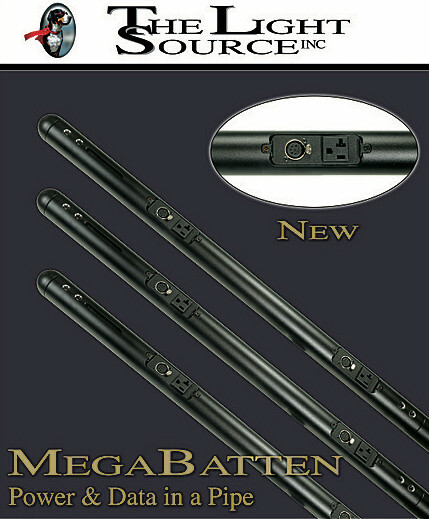 Fixtures and scenery may be located over the entire length of the MEGABATTEN, and even directly over unused outlets. This is accomplished by milling pockets in the wall of extra strong schedule 80 aluminum pipe to recess the power and data receptacles inside the circumference of the pipe. 20-amp Edison receptacles are spaced every 16” with a 5 pin XLR receptacle right next to it for data. The MEGABATTEN is ETL listed to the UL 1573 Stage and Studio standard as a connector strip. 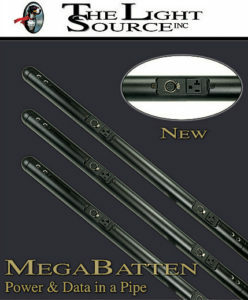 The MEGABATTEN is listed to support a load of 30 pounds per linear foot when supported on a maximum of 8-foot centers. Power and DMX are available anywhere a light is placed on the MEGABATTEN. The product can also be special ordered to be bent on a radius for circular hanging positions with included power and data.